The ALX 3138 is a high performance 1:1 print & apply system for a wide range of industrial applications.Batch numbers, barcodes, date of manufacture, product descriptions, graphics – the amount and complexity of variable information on products and packaging is increasing all the time. The need for quicker processing, faster printing and more reliable print & apply systems grows rapidly.Designed to exceed all current and future expectations, the ALX 3138 offers the very best in performance and build quality on the market today. 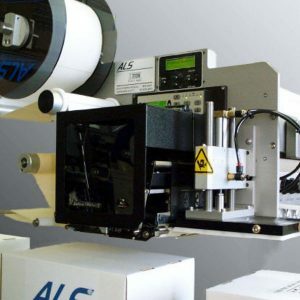 The ALX 3138 Print & Apply label applicator uses a thermal transfer print engine to over-print variable text, graphic or barcode information onto labels and apply them utilising tamp-blow, air-blow or direct (“wipe-on”) application techniques. A large variety of print sizes, plus capabilities for printing barcodes, real-time data and sequential numbers on the same label, are standard features. One-to-one print and apply allows for the immediate application of each label as it is printed. The ALX 3138’s rugged corrosion resistant, stainless steel and anodised aluminium housing provides durability and maintenance-free operation even in hostile environments.